After privatisation in 1984, British Telecom started to introduce the utilitarian “KX100” phone box, a flat-roofed steel and glass telephone box to replace the iconic red kiosks designed by Sir Giles Gilbert Scott. It did not go down well with the British public. After many of these familiar fixtures were unceremoniously scrapped, a noisy campaign was launched and 2,000 of them ended up being listed. As time went on, British Telecom – now rebranded as BT, with a jaunty new blue-and-red piper logo – got wiser to the public mood and introduced a nostalgic new model with a curvy shape that referenced the originals, the “KX+”. So, like boxy Eighties taxis and Fiat Pandas, boxy boxes became a rarity themselves – you could almost get nostalgic for their uncompromising sharp edges and cheery, bright plastic doors if you tried hard enough. To coincide with the countdown to Brexit, all this month until 29 March the London artist Joe Sweeney has installed a sculpture that’s inspired by one of these now defunct Thatcher-era phone boxes on the beach at Dungeness in Kent, a windswept seascape famously home to film-maker Derek Jarman’s beach hut and garden. And also one of the nearest British headlands to the French coast. 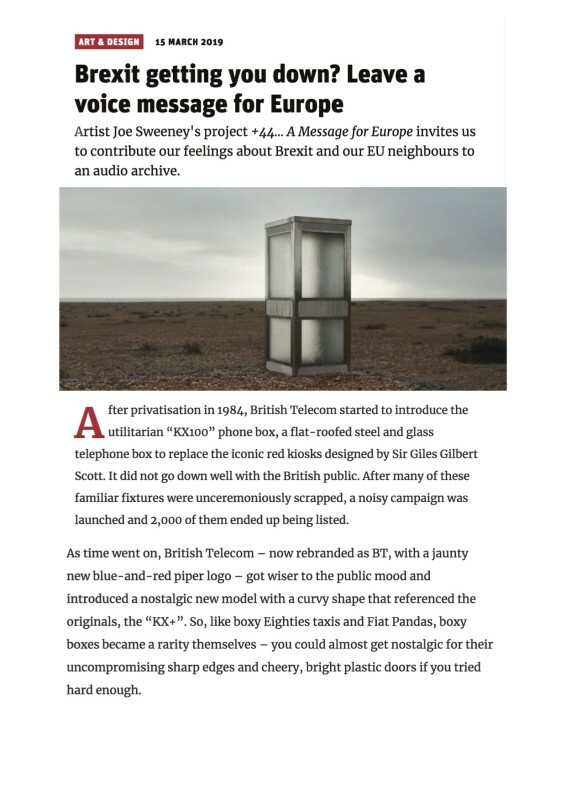 The phone box is one element of a two-part piece by Sweeney entitled +44, which invites the public to pick up the phone (or laptop) and leave “a message for Europe” and share their feelings about Brexit. Sweeney wants this to be a neutral forum where people can speak honestly and freely, in contrast to the polarised and aggressive text-based debate that happens online. In a world in which we’re constantly messaging, texting and tweeting, there’s something refreshing about talking – and nothing more potent and nuanced than the human voice. The phone box embodies this nostalgia, both in form and function – and addresses an event (Brexit) that has largely been fuelled by nostalgia and emotion. The human voice is the most powerful form of communication, in which tonality is key. By recording participants’ messages for Europe, I want to capture the humanity of the general public, and the voices that I feel have been lost to the debate surrounding Brexit. I believe this archive has an important role to play in our understanding of this moment as we experience it now, and when looking back in the future. Sweeney has left his metal box untreated so over time it will weather and decay from British rain and North Sea spray to become a post-apocalyptic rusted hulk looking towards France. It will stand as monolithic testament to a faded past and an uncertain future, just as derelict phone boxes now sit unused on our high streets.